View our loose diamonds here. Loose diamonds prices are much lower today than they were just a few years ago because of the advantage buyers have with the internet and the loose diamond pricing trends over the years has changed to benefit the consumer. Loose diamonds pricing trends have been on on the downward march for most buyers although the price of diamonds from suppliers may have even increased. Well how can this be? The answer is in the way that loose diamonds are marketed and sold today compared to how they were marketed and sold a number of years ago. Much has changed with loose diamonds and the consumer is the clear winner. Not that long ago, loose diamonds were part of a supply chain with many intermediate players. The number of hands that a diamond went through before it was sold in the retail market was sometimes up to 5 or 6. Every hand marked the diamond up and then passed it along to the next level until if finally ended up in a jewelry store for sale to the public. The jewelry store with it's cost of retail mall rents, overpaid staff, advertising and insurance costs, are forced to markup loose diamonds and jewelry for great profits as a necessity to survive. The markup on a loose diamond and the retail price of that diamond was very high just because of the cost to bring it to the retail market. This is not unlike many other products that you can think of that are now sold on the internet. With the advent of the internet, the way loose diamonds are priced and sold has changed forever. Sure you can still go to a jewelry store and buy a diamond but you will be paying more - the question is just how much more. Loose diamonds today are more often being purchased from online jewelers like Novori Jewelry, who have access to huge inventories of 1st quality, independently certified loose diamonds and can determine and evaluate loose diamonds pricing trends on a daily basis. Since we deal directly with the diamond cutters and manufacturers, our prices are the lowest you can find in the retail setting. Diamonds are not handled by middlemen but are sold directly to the public in a retail setting online. Be warned you will always find store both brick and mortar or online advertising "wholesale diamonds" or "diamonds at a wholesale price" for sale but you should know that there are regulations against this and any store that sells to the public is selling at a retail level and should be advertising this in order to be up front with their customers. Although our loose diamonds seem to be priced like wholesale diamonds, we are a retailer and market and sell our diamonds honestly and fairly. For first quality loose diamonds at the best prices, compare any diamond at Novori Jewelry. Only purchase a NATURAL diamond that has not been enhanced, laser filled or irradiated. (All Novori loose diamonds are natural diamonds). Buy directly from the retailers web site for the best prices - not paid advertisement sites. As time goes on, you may find web sites that offer diamonds from a select number of dealers. Just understand that the dealers have paid to be at the site and their prices are going to be somewhat higher just to be at that site. At Novori Jewelry, our costs are kept low by offering top quality loose diamonds, certified by recognized independent laboratories at a price that cannot be beat. Our loose diamonds are priced for value and the savings are passed along to you. When shopping for engagement rings or loose diamonds, always be educated on your purchase, know what you are buying and allow Novori Jewelry to offer you a certified diamond at the best possible price. Loose diamond price trends may go up or down in the future but certified loose diamonds will always be priced the best at Novori Jewelry. 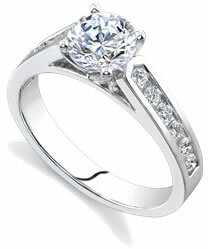 We stand behind our diamond prices with a diamond price guarantee. If you need assistance our diamond experts are here to help you select the perfect loose diamond. Just give us a call toll free at 1-877-877-4141.